It’s March, finally, this is the month things will really start to happen. For those of you who are new to my column and those who forgot when I mentioned it last year, we gain about 1 hour and 45 minutes of daylight this month, that will trigger all kinds of behavior in the bird world. When I mentioned this to my mother, she replied that daylight savings time starts a couple weeks early and that’ll help the birds out. If you can figure that one out, drop me a line, maybe they have more time to fix up around the nest after work? I want to start getting ready, the blackbirds will be back in a couple weeks, a welcome sign of spring, I enjoy them for a while but don’t miss them too bad when they disperse to breeding grounds. They do a nice job cleaning up under the feeders, although this year they’ll need to do some major excavation to get at the fallen seed. I’ll put lots of cracked corn on the ground when they return, if the snow hasn’t crusted over by then I’ll feed it on the driveway and beat an area down in the snow. I do love watching a big flock of male Red-winged Blackbirds take flight and flash that beautiful red patch. Last year there were Eastern Bluebirds back in New Brunswick in March and actually building nests by the first week in April. Tree Swallows will follow soon after and our wintering chickadees are starting to think about spring, singing more and inspecting the odd nest box. Although they won’t be arriving in our province for another 2 months, the Ruby-throated Hummingbird has started it’s journey north. A few have already crossed the Gulf of Mexico, soon I’ll be getting emails from snowbird friends, bragging about a hummer at their Florida feeder. What do I respond with? I have a picture of the great view taken from my roof while shoveling off the snow and a picture of me up to my waist in snow...on the roof, I’ll send them that and mention all the roofs that collapsed. They should have something to worry about other than what level of sunscreen they should apply. For now I’ll have to be content looking at my one lone male robin coming to apples and sumac berries, I might even be able to trick myself into thinking it’s a sign of an early spring, except he’s been in the yard since December and we’ve had quite a bit of winter since then. No, robins won’t be a sign of spring until they arrive by the hundreds, accompanied by flickers in the ditches and any bare ground they can find, those are the robins that signal spring, and they’ll arrive a week or two after the black birds. That’s also the time I like to be in Albert County for the hawk and sea duck migration, there are a few good areas to watch, but the best has to be in New Horton on route 915, the little Baptist Church is a well known hot spot for area birders. You have great views of hawks as they approach, if the conditions are right the birds will glide and ride thermals giving experts and beginners plenty of time to study these specks in the sky and decide what species it is. On the best days a few hundred hawks and a few thousand ducks will pass by on their way up the bay. Scanning the individuals and flocks trying to pick out something different or even rare is a great way to spend a sunny early spring day, that’s the best part, if it’s raining or there’s a cold north wind, you might as well stay home by the fire and watch birds out our window, there’s not likely going to be too many hawks on the move. After a period of bad weather, the first warm sunny day with a south wind is bound to be productive. What better place to be than New Horton or Cape Enrage watching what flies past? Photographers are likely to be disappointed, most of the hawks are just specks, even with binoculars and spotting scopes there are only certain field marks you’ll be able to pick up. Colours aren’t as important as patterns, size not as important as shape. Size of wings, head and tail in relation to other body parts come into play, the way they flap their wings, the way they hold their wings when they soar. A little study leading up to the day will pay off, most field guides are of little use on a hawk watch, my trusty Peterson guide with it’s pictures of perched hawks doesn’t cut it, Sibley’s is better but if you really want to identify flying hawks from a distance you’ll want to read books specializing in that field. My all time favourite (non-field guide) bird book is Hawks in Flight, by Pete Dunne, David Sibley (yes the same Sibley) and Clay Sutton, the cream of the crop, who have all written several recommended books. Pete and David are writers for Birders World magazine, (who by the way just changed the name this month to BirdWatching Magazine so if you’re looking for it on the news stand it’ll have a slightly different look.) Clay Sutton wrote several books, including How to Spot Hawks and Eagles. I’m anxiously awaiting my copy of Hawks at a Distance, by Jerry Liguori, praised by both Dunne and Sibley it promises to improve my identification skills. Don’t get too intimidated when you pick up one of these guides, I narrow the list to what I’m going to see in New Brunswick, I don’t waste precious brain cells memorizing all the traits of a Swallow-tailed Kite for instance. Then just before the day, I’ll brush up on what is likely to be passing through that time of year. I can follow other birders reports or go back to online archives to see trends. I’ll take my books, labeled with post-it note book marks for easy reference, but I usually only look at them after the bird moves on, taking all the time to absorb as much information as I can. If you’re really into hawks, and really enjoy challenging yourself and your identification skills, then a hawk watch day may be for you. If you aren’t so sure you could get excited about standing on a hill studying specks in the sky then it’d be a good idea to drive separately, you’ll be miserable and you’ll drag the rest of the group down with you. Remember, you’ll want warm cloths, sun screen, lip balm, sunglasses, water and lunch. This isn’t watching gulls by Captan Dan’s in Shediac in the summer, this is Albert County in March and April, it’s cold and nothing is open, so take everything you’ll need with you. If you’re lucky, there’ll be a couple veteran hawk watchers on the sight, you’ll get to hear the lingo, and someone will be able to tell you if you’re on track or totally off base with your identifications. It’ll take some practice to even be able to find the speck in question, you’ll be looking into a clear sky with no reference points. It’s not like finding the crow someone points out in the birch tree at 3 o’clock. (the position, not the time). It’ll be more like, “11 o’clock, 2 fields (field of view of a typical binocular) above the horizon, it might be an eagle...or a small aircraft.” So you find it and watch until it gets closer and more clues start to show up. 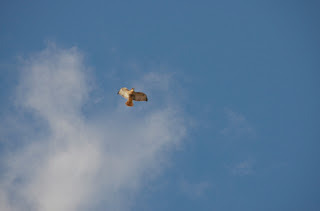 For me the best thing that came out of studying hawks for a migration watch was being able to identify the ones I see flying over my yard, without the aid of optics. It’s a lot easier to do the yard work without running for my binoculars every time a hawk passes, my yard is just north of the good hawk watch sights, although they disperse somewhat, quite a few still fly over, keeping me on my toes and giving me lots to look at. Q: I have a black and white bird coming to my feeders, my friend says it’s a Snow Bunting but it doesn’t look quite like the one in my book. Is it a Snow Bunting or something else? A: In the cases, where the bird (or picture) almost fit the image of the Snow Bunting in the field guide, it was indeed what we were looking at. 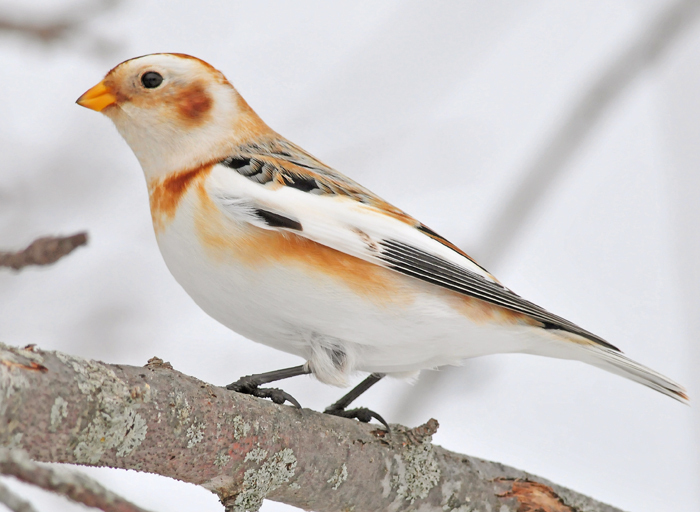 Snow Buntings only have one molt per year, the summer plumage is brownish and instead of molting into a breeding plumage, the tips of the feathers wear off leaving the males black and white by the time breeding begins. Males will even rub on snow to speed up the wear. A hardy little bird though, when he returns to the high Arctic breeding grounds with these worn down feathers, the temperature could still be -30 degrees. So if the bird or picture you’re looking at isn’t in the same stage of wear as the picture in your field guide, it wouldn’t look exactly the same. Some guides show more plumages than others, even then there will always sightings of birds with plumage in between. If you search on line you’ll usually come up with a picture that matches and chances are if it’s dated it will coincide loosely with the time of year your bird was spotted. Snow Bunting tend to like open fields, I’ve only had them in my yard twice in 19 years, but when I lived in PEI, there were thousands in grain fields and roadside for grit. Many took advantage of my fathers ground feed, I took them for granted but now I’d be very excited to have even a pair in my yard. Q: I have a small pair of binoculars, 12x25’s, I’d like to be able to get better looks at the birds I see. Should my next step be a spotting scope or should I get a camera with a telephoto lens? A: It depends on your budget and what you want to achieve. If you want to learn more about birds, how to identify them and their behavior, I’d go for the scope. If you want to get high quality pictures, then you’ll need a high end camera. If you just want a photo for the record and aren’t planning on blowing it up or having a calendar printed you might be happy with a point and shoot digital and a spotting scope to play around with digiscoping. Before I made any hasty decisions that are bound to be expensive, I’d try out a good pair of 8x42 binoculars. Whether you choose a camera or a scope your birding skill will increase greatly if you can more easily locate and observe birds doing what they do. Then if you want to get a really close look or take a picture that’s great, but sometimes you don’t have a lot of time to observe the bird and note the various field marks, if you spend it trying to take a picture, you may have missed out. Trying to identify birds from one or two pictures can range from frustrating to impossible, noting as much as you can while the bird is moving around in front of you is more important than the picture, if you’re trying to learn. I have some friends who subscribe to the “shoot first and ask questions later” philosophy, but they aren’t progressing in their identification skills as fast as others who are content to sit and observe. For every picture they show me that can identified, there are a dozen blurred shots that even they don’t know the species. The really good bird photographers I know, were good birders first. Some specialty stores will have demo binoculars that you’d be allowed to take out into the field and give them a really good test, take you own pair along to compare. Don’t go on the brightest part of the day, good binoculars really shine in low light conditions. Compare the field of view, brightness, clarity, even close focusing with your 12x25 pair, for birding I’d guarantee an 8x42 (or 8x40) will make you much happier and give you the views you’re looking for. I have a friend with a steady hand who can take a picture with her digital camera held up to one barrel on her binoculars. The pictures aren’t going to make the cover of Birdwatchers Digest (Mechanics Illustrated maybe) but she has an identifiable picture and a record for her yard list. I think it’s safe to say that the farthest thing from your mind right now is mosquitoes, but as I was on the roof shoveling off some of the 4 foot accumulation of snow, I was thinking about what I could write about this week, and mosquitoes came to mind. Actually it was nest boxes, I was also looking at a rather large amount of snow on some of my bird houses, a couple poles had bad leans and the box that was on my collapsed arbour may or may not be salvageable, I’ll find out when the snow melts. I thought if these poles break off I’ll have to get them replaced early, before the swallows return or my summer will be even more mosquito infested than normal. Later that night I was reading around the web and discovered that it’s National Nest Box Week, at least in Britain, they say it starts on Valentine’s Day and is the traditional time when birds pair up for the new breeding season (?). I kind of missed the boat on this one, but here in New Brunswick, I think we still have time, later spring and all. The idea is a great one though, a reminder to get out and clean out old nests, repair damage and possibly build a few new boxes. I find a few boxes each spring that had been commandeered by a larger bird like a Hairy Woodpecker, they usually enlarge the hole and spend the long winter nights inside. Swallow boxes would be too small for them to nest in, so after things warm up and the woodpeckers are thinking about nests, I’ll replace the hole. I do this by drilling the appropriate sized hole in a small piece of board and nailing it on over the enlarged hole. This will also act as a predator guard by making the entrance thicker, therefore harder for a cat, raccoon, or even another bird to reach in and down to steal eggs or nestlings. If you don’t have any scrap, don’t worry, I have lot’s and keep these “holes” on hand at no charge. If you have a persistent squirrel chewing out the holes, you can use a metal washer or drill a hole in a piece of sheet aluminum and nail it over the hole. If you’re planning a few new additions and haven’t already placed your poles, it would be a good idea to get ready for when the snow melts as I’m sure this year there won’t be a whole lot of time between the thaw and the nesting. In some cases it’s possible to put nest boxes in water, this is a great idea for Tree Swallows, it puts the box right in the best habitat and the water around the pole is a great barrier to some predators, like cats and squirrels. Now is a great time to drive long poles into the pond bottoms, after testing the ice, chop a hole in a likely spot and drive the post through the ice, you may need a step ladder to get high enough to drive the pole, but imagine how much easier it is to stand on a step ladder on solid ice than it would be in a canoe this spring. Another thing I need to do to get ready for mosquito season is add another bat house, last year I had one in a bat house and one behind an old, now tattered banner that needs to be replaced. The little guy behind the banner was very popular last summer, he had his photo taken many times. As the sun came around to that side of the shop he’d inch his way down to the bottom where I guess the air was a little fresher, he was about 2 feet over my head. I’m pleased to say that most people were very intrigued and I can’t recall anyone who was scared of him. Ten years ago it would have been a different story, I would never have pointed him out as to many people would have left screaming. Next year Little Fuzzy will hopefully get used to a nice new bat house, I’d hate to loose either of the two I have left, I keep hoping one finds a girl friend, a breeding colony would be even better. I also plan on building a fake chimney in hopes of attracting some roosting or nesting Chimney Swifts. I found plans online for what is basically a 10 foot long box, open at both ends, I have just the place on the back side of my shop, and while I’m up there I’ll put a few shelves to give the Cliff and Barn Swallows a head start on making their nests. The more bug eating birds, (and bats, and dragonflies) the merrier, if you have any you don’t want, send them my way. If you want to attract some to your property, nest box building is a great week end project. You don’t have to be a finish carpenter, the rougher the better for the birds, often you can even reclaim old wood, again rough sawn is preferred over more expensive dressed lumber. Target the species you want to attract and build the nest box to the appropriate dimensions, I have step by step directions and plans for most of our cavity dwellers on line at thebirdgarden.blogspot.com. We might as well get to work now, in a few weeks we’ll be dealing with run off and flooded basements, then we’ll be fixing everything that collapsed under the weight of the snow, before you know it we’ll be swatting mosquitoes and it’ll be too late for another year. Until you get to know them, the Pine Siskin seems like an ordinary little brown bird, it often gets mistaken for a sparrow and female of immature Goldfinch. Watch them for a while though and you’ll see that they “act” more like a finch than a sparrow, quite acrobatic, they can hang up-side-down off a feeder perch or tree limb to get seeds. Although they will go to the ground for dropped seeds, they don’t scratch around like a sparrow would. Also, as the old saying goes, you can judge a bird by the company it keeps, when they show up at feeders they are often traveling with other finch, which is likely why people mistake them for Goldfinch or even a “baby” Purple Finch. Both sexes have heavy brown streaks, but the male has more yellow showing between and a yellow wing bar. They’re the same size as the Goldfinch, but if you take a closer look at the beak, it’s much finer. Don’t underestimate it though, although they appreciate nyjer and hulled sunflower seeds, they have absolutely no trouble cracking a black oil sunflower seed and extracting the meat. Good news if you’re on a budget, you don’t need to buy enough nyjer feeders so everyone gets a place setting at the buffet, they’re quite happy with the small sunflower and if you have extra guests drop by for a while, it won’t break the bank to spread a little extra on a platform feeder or even on the ground. This very friendly year round resident in New Brunswick, is welcome at my feeder whenever they pass through. They aren’t very afraid of people, you can usually get very close before they take flight. Several times I’ve been startled when I lifted the feeder and one flew off, usually only doing a short loop and landing on the hanger to wait for me to finish refilling. Sometimes when I’m feeling extra patient, I’ll get them to eat from my hand and I’ve offered a finger to fledglings and had them perch a while. They seem to love the window feeder, very few activities inside the house scare them off, even our great indoor hunter cat pouncing at the glass doesn’t always flush them. Watch for them in winter traveling in mixed finch flocks, there undulating flight and calls make them easy to pick out. 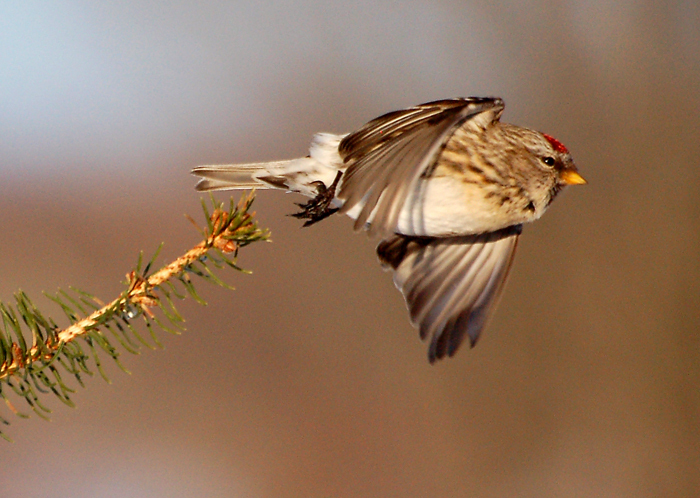 The Common Redpoll is finally making appearances at most bird feeders. I read this would be a good year and since they usually come south every other year, it was an easy prediction to agree with. And the were around earlier, but until the snow got dumped there was plenty of wild seeds available. I saw and heard them in the woods, on birch, tamarack and aspen trees, as well as the many weed and flower seeds still not buried. Streaked heavily with brown backs, these guys resemble the Pine Siskin, that is until a brightly dressed male turns around and you see the pink breast, bright red head and black bib. They too call in flight and when perched in the top of trees, they’ll readily mix with the other smaller finch to give a great spring-like concert on a winter day. They’ll be leaving us soon, they don’t nest in New Brunswick, but if the pattern holds true, they’ll be back in two years to take advantage of our hospitality. The Hoary Redpoll is similar to the Common Redpoll, it’s slightly larger, lighter, less streaked and has white over the rump. The beak is also shorter and more stout. Males stand out but the females and immature may require a little more study. In years redpolls come south there’s usually a few Hoary around, but they are greatly outnumbered by their cousin. They likely just find New Brunswick winters too warm, they’re more at home in the Arctic, in even bleaker conditions than the Common Redpoll. They have extra fluffy feathers, and are feathered in areas other birds aren’t, if they get too warm, they actually pluck a few to cool off. They grow back in a few days, which is a good thing in case the temperature drops. Over the years there have been several changes in the common names of birds, the Marsh Hawk is now the Northern Harrier, Canada Jay became the Gray Jay, I’m not old enough to remember the changes to the falcon family, but they were once called Duck, Pigeon and Sparrow Hawks, my father and his peers still use those names, sending me to Wiki or my antique J.J. Audubon to find out which one he’s talking about. If you thought it was hard to keep up with the various changes in the common names, try to follow the changes among family, subfamily and genera of these birds. As DNA tests are done, some birds are moved from one group to another, species are being combined into one, split into two, in the case of the Baltimore Oriole, both. (it was combined with the Bullock’s Oriole to form the Northern Oriole, then re-split into it’s original parts), making your lifelist go up and down without ever lifting your binoculars. 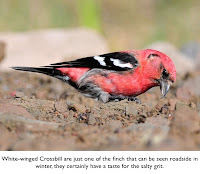 This week I want to write about the our winter finch, I was going over in my head the species I’d include. Like many out there I got my start with a Peterson guide, in it there’s a few pages of finch; red finch, yellow finch and blue finch. In my Peterson guide all the birds I was going to talk about fell in this category, a quick check reveled that although ornithologists were busy changing common names they were much more so when it came to changing scientific names and rearranging groups. It makes my head spin and even if I could totally follow along, it would make a pretty boring read. All this to say I wanted to include the cardinal, as in my old Peterson it’s listed as a “red finch”. It’s actually grouped with the Rose-breasted Grosbeak (which makes more sense in french as Cardinal à poitrine rose), Blue Grosbeak and just recently the tanagers, but to keep you on your toes, the Evening Grosbeak and Pine Grosbeak are grouped with the finch. This has been a banner year for finch at feeders with every member present and accounted for, even the odd Cardinal. The Evening Grosbeak is still common, it could show up at feeders almost any time of year and there’s been an increase in activity this winter. The males are bright yellow, with black head, tail and wing, the secondary wing feathers are white, they have a bright yellow forehead and eyebrow. The beak is a massive yellow green cone, perfect for cracking seeds and biting the hand of a do-gooder trying to rescue one after a window strike. Being quite familiar, I use the Evening Grosbeak as a standard of measure, “it’s grosbeak sized”, “it’s slightly larger than a grosbeak”. So for those unfamiliar, they’re 8 inches, which doesn’t tell us much unless they’re in your hand or perched beside a ruler, but that makes them about half way between a chickadee and a Blue Jay. The Pine Grosbeak is our largest finch, slightly larger than an Evening Grosbeak, the males have red head, breast, back and rump, washing out to gray as you go down. The dark wings have two white bars. Females are yellow olive in the places males are red, young males resemble females until their second year when they molt into the red feathers, but some will have a russet plumage prompting reports of three different birds. They usually come to the yard for left over fruit but will also take sunflower seeds at feeders, they are very tame and approachable. 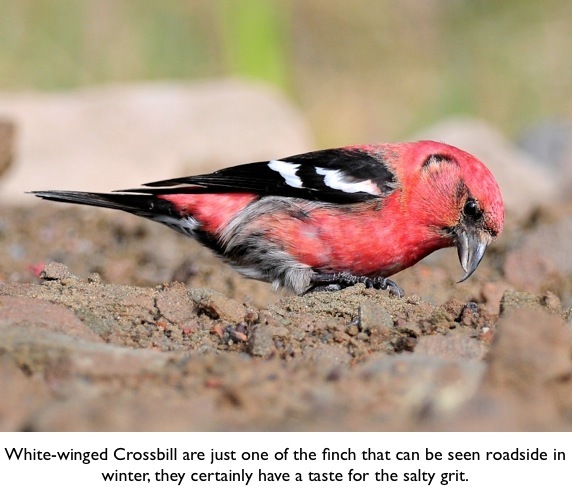 This winter has had an increase in both Red Crossbills and White-winged Crossbills visiting feeders for sunflower and nyjer seed. The males are red with darker wings, females are olive and first year males may appear to have an orange cast. The White-winged will have more streaking on the flanks and two prominent wing bars, the beak is also smaller than the Red’s. The coolest feature is the beak, it totally crosses over, like when you cross your fingers, this design is made for spreading the spruce cones and extracting the seeds, a White-winged Crossbill can eat 3000 conifer seeds per day! I’ve had crossbills at feeders several times and I usually mistake them for Purple Finch at first glance, it’s usually that they don’t fly away when I approach that makes me take a closer look. Purple Finch are certainly more plentiful in the other three seasons, but the odd ones do decide to stick around for winter. The males are red, and lightly streaked, females are brown resembling a sparrow, but the beak is heavier, she also has quite a distinct light eyebrow, helping distinguish herself from the female House Finch. Mostly dining on sunflower they do take the odd nyjer seed. House Finch were introduced to eastern United States from western states and Mexico in 1940, captured and caged they were sold in pet shops as “Hollywood Finch”. To avoid charges under the migratory bird act, owners simply released the birds, since then they spread across much of the eastern continent. All the House Finch in the east can trace their ancestry back to these relatively few released birds, the result of the inbreeding may have made them more susceptible to the eye disease Mycoplasma gallisepticum or House Finch Conjunctivitis. Although it has been found in other species it is predominant in House Finch. The males have varying degrees of red, depending on the diet, some males may even appear orange. Females are brown and both sexes are more heavily streaked than the Purple Finch. Both these species are the same size and with the variations in the House Finch, it sometimes makes it tricky to tell them apart. Two or three of my all time favourite birds are in the Paridae family, if this doesn’t ring any bells don’t worry, I had to look it up too. You don’t have to have the scientific names of every bird memorized to be what everyone seems to term an “avid birder”. On the off chance you ever need that information it readily available, all my field guides include them and of course there’s Wiki. Our representatives of this family are the Black-capped Chickadee, Boreal Chickadee and (recently) Tufted Titmouse, I say two or three of my favourite birds because I’ve yet to meet a Tufted Titmouse but from what I see I’m sure I would love to have one at my feeders. I don’t think I’ve met more than a handful of (grumpy) people who don’t include the Black-capped Chickadee in their most liked birds, being our provincial bird I think it’s required on your New Brunswick citizenship application. These tiny acrobats are at home spending much of their day upside down gleaning insects from tree branches and making frequent trips to the sunflower feeder. Any day now we’ll hear more of their territorial fee bee call, as the days lengthen even more the urge to set up territory will go into overdrive. 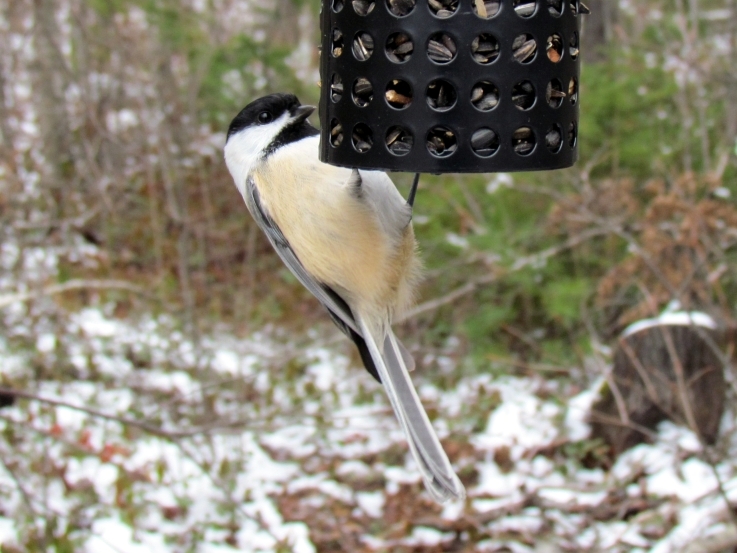 As spring approaches you’ll have fewer visits to the feeders as Black-capped Chickadee have a rather large 10 acre territory, so most feeder yards will be lucky to have even one pair through the breeding season. That their diet changes from 50% seeds in winter to 10% in summer also accounts for a decrease in feeder activity. For now though, chickadees are likely one of the most numerous species at the feeders, enjoying black-oil sunflower, hulled sunflower, suet and occasionally other seeds, they can also be seen hammering open rather large pupae and hovering around window sills and under eaves for spiders and their eggs. They’ll excavate their own cavity for nesting, or take a man made nest box, with inside dimensions from 3x3 to 5x5 inches and a hole as small as 1 ⅛ inches. Since they’ll readily take a box also used by Tree Swallows and Eastern Bluebirds, I tend to make my holes 1 ½ inches to allow the larger species while still thwarting the dreaded starling. This increases the odds of getting a bird nesting in your yard. The small hole is a good idea if you live in an area with House Sparrows or want to place the chickadee house on the edge of the woods where squirrels would likely take it over. In this case I use the metal predator guards with a 1 ⅛ inch opening to keep the squirrel from enlarging the hole. The Boreal Chickadee is a close cousin to the Black-capped, but not seen nearly as often. The occasional feeder operator is lucky enough to host a one, but most sightings are made in a spruce forest sending beginners and non birders running for a field guide. Noting the brown chickadee I’ve had some folks mistake this for the Chestnut-backed Chickadee, but a quick check of the range maps and a look at the Boreal’s picture usually confirm what they saw. If you’re on a mission to add this bird to your list, you’d be wise to learn the song, you’ll recognize it right away as a chickadee but it’s more nasal and harsh, with the emphasis on a different syllable. A very hardy permanent resident, this tiny bird stays put year round as far north as the tree line, but a true Canuck they rarely venture across the border into the US, you pretty much have to come here to see one. Which may help explain the relative lack of information when compared to it’s more common relative. The Boreal is often left out of beginner guides, and when I checked the usual on line sources the information is so scarce I thought all the white space on the page was a computer error. I even noticed a mistake on my favourite website, www.allaboutbirds.org, hosted by Cornell University. So I guess nobody’s perfect. Check it out, if you notice the mistake, drop me a line. This bird will nest in the same box as the Black-capped (but I can only recall 2 reports locally), and also excavate their own cavity. They also stash food for winter, the seeds are usually from spruce, but mostly it’s insect larvae that get stored. I wonder what happens to these if the bird doesn’t retrieve them? I’d be scratching my head if I came across a hollow tree full of larvae from a variety of species. I remember getting numerous reports of Tufted Titmice years ago and I always thought they were actually seeing waxwings (especially when there were flocks of them), but never say never, the Tufted Titmouse has been expanding it’s range and is now in New Brunswick, hopefully I’ll live long enough to host one in my own yard. I’m not sure why they call it the “Tufted” Titmouse, I know you’re going to say because it has a tuft on top of it’s head, but that doesn’t differentiate it from all the other titmice, they’re all “tufted”, although all my guides call it a crest, so maybe I’m missing something. They visit the feeders in much the same way as the chickadee, taking one seed at a time, they also nest in old woodpecker nests or a nest box, but Tufted Titmice don’t excavate their own cavity. Again, the key to first seeing this bird is learning the songs, they have a chickadee like call but also a loud peter, peter, peter song. It’s always a good idea to learn the most common birds songs, if you know the Black-capped’s repertoire, you’ll recognize the difference when you hear a Boreal or Titmouse. Last week I talked about the four most common species of woodpeckers in New Brunswick, this week I’ll finish the other five that for most of us aren’t as common. Although the Yellow-bellied Sapsucker breeds extensively in New Brunswick, it’s not reported all that frequently. I see the odd one around the yard, sipping sap from a small hole it drilled in my maple, I hear them more often now that I’ve learned their drum; unlike our other woodpeckers it stalls part way through and picks up again at the end. Reports do spike in breeding season when they find a resonant spot on your eave, stove pipe or metal ladder. They’re early risers and if one is drumming on your windowsill at the crack of dawn, it’s hard not to notice. They don’t frequent feeders either but every now and then one will discover the sweet offerings we put out for hummingbirds or orioles. If you do get one hanging off a small hummingbird feeder you may want to get the larger version meant for orioles so less gets spilled while he’s feeding. Don’t forget to try some grape jelly either, the sweeter the better. They sometimes visit the suet feeders, but I wouldn’t run out and buy some just for sapsuckers, in 20 years I’ve only seen 2 on my suet feeders. The Yellow-bellied Sapsucker is considered a keystone species, that is they are vital for the maintenance of a community. 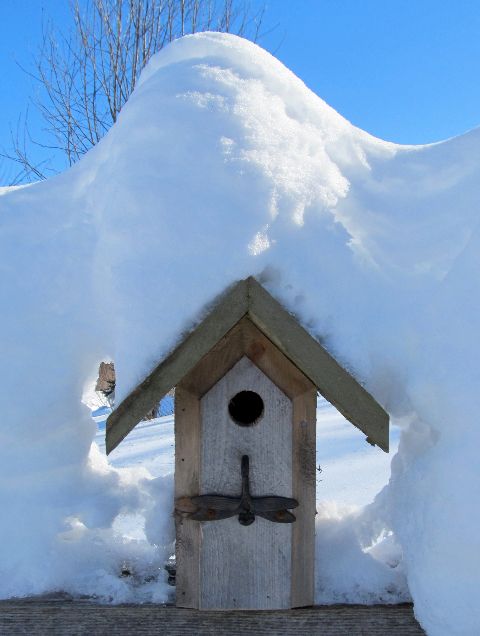 There are 35 species of birds that benefit from the sap and the insects that are attracted to the sap wells. It’s not coincidence that the our sapsucker arrives a couple weeks before the our hummingbirds, they have some time to set up house keeping, get some trees tapped and the sap running in time for the hummers arrival. Researchers have noted hummingbirds chasing off other larger species, they don’t however, chase away the sapsucker, so the relationship may be mutually beneficial. Although the hummingbird eats a lot compared to it’s body weight (The heaviest hummer weighs less than one loonie and lightest less than a penny or it would take 14 small hummingbirds to equal one Downy Woodpecker), it’s very little compared to the amount of sap a larger species would rob. I hear suggestions to get your hummingbird feeders out early in the spring so the first arriving birds will have something to eat, and while I’m all for it, the truth is these birds have been arriving before most New Brunswick flowers bloom long, long before anyone ever thought about the small red nectar feeders. The Yellow-bellied Sapsucker is our most migratory woodpecker, the only one who doesn’t even appear on the NB winter list (going back to 1996) and that makes sense, there’s not much sap running here in January. Although not commonly reported this woodpecker of the boreal forest can be found across New Brunswick, (I saw my first in Moncton city limits). Look for it anywhere there are dead or dying conifers as it feeds by flaking off the bark eventually removing all the bark from a snag. One of the favourite foods is the larvae of the white-spotted sawyer beetle, this insect can detect the light given off by a forest fire and moves in shortly after to deposit eggs in the dying trees, this in turn draws the woodpeckers. One reference states a Black-backed eats more than 13,500 larvae annually, that’s 40 of these fat juicy grubs daily. The Black-backed is mid sized, with an all black back, the primary flight feathers are spotted white, the sides are barred black and white, white belly and yellow cap on males. The Three-toed Woodpecker is less common than the other three toed woodpecker, he has similar feeding habits but will more readily feed on the sapsucker wells. Slightly smaller, it has white bars on the back, more barring on the sides, white speckles on the head and the males also have a yellow cap. The Red-bellied Woodpecker is one of those species that was named when the ornithologists shot first and made identifications later. Dead, on it’s back, the red on the belly is visible; alive and on a tree trunk it’s not so noticeable. Every few years this woodpecker will move into our area for the winter, like the other woodpeckers that come to feeders they enjoy the suet, but this one will take sunflower more readily and truly loves peanuts in the shell. When they are around I have a spike in peanut in the shell feeders and I always say, this feeder won’t magically attract a Red-bellied to your yard, but if you get one, it’ll be going to this feeder. One winter we had one who made it his mission to fill a hollowed out apple tree with sunflower seeds. He made constant trips from the feeder to the tree to drop the seed in and seemingly listen for it to hit bottom, perhaps judging his progress. Unfortunately for him, a red squirrel was making it his mission to remove the seeds as fast as they were being cached. This guy stayed all winter into spring and even started his mating call and drum, but after having no success on the girl front, he moved on. There were several females in New Brunswick that winter, but I didn’t hear of any of them hooking up. While a lot of woodpeckers have red on their heads, there is only one Red-headed Woodpecker. They are entirely red from the shoulders up to the beak, the black is all black and the white is all white, making this one striking individual. Now considered our most rare woodpecker, (by me at least, as I still don’t have it on my New Brunswick list), it used to breed here. The same winter we hosted the Red-bellied there was one down the road in Riverside-Albert, I didn’t bother to go see it, we had one on PEI when I was younger and thought if I’d already seen it, then it mustn’t be very rare. I should have gone, as the sightings are getting fewer and farther away. When a birder comes by and asks what birds I have around today, I run through the list of what I can remember seeing recently and I usually say, “...and both woodpeckers.” I hear others saying that too, we’re referring to the common feeder visitors, the Downy and Hairy but we really should be more specific. Did you know there are nine species of woodpeckers quite possible in New Brunswick? Undoubtedly the Downy Woodpecker the most familiar, the friendly little bird frequents feeders and often stays put at the feeder while you approach very close. On several occasions I’ve been startled when I picked up a feeder not noticing one on the opposite side. It’s our smallest woodpecker, weighing about the same as three loonies, so theoretically my wife could have ten of them in the bottom of her purse at any time and not notice. Very similar to the Hairy in appearance, they have black backs checked with white, black and white striped heads and the outer tail feathers are white, on the Downy they typically have black spots, but the easiest way to tell them apart is the bill length when compared to the head. The bill of a Downy is about half the depth of the head while the Hairy’s is about equal. So if you’re taking pictures and want to be able to differentiate, try to get a full on side shot, sometimes when they are looking directly into the camera they’re harder to tell apart and if they are looking on an angle a Hairy may even look like a Downy. The males of both species have a bright red patch on the backs of their heads. The Hairy is quite bit larger, it can weigh up to 13 loonies, (so my wife would notice ten of these in her purse), they are dominant at feeders but in nature the two feed on different parts of the tree, the Downy’s smaller size allowing it access, even feeding on weed stems and the Hairy’s heavier bill allows him to dig a little deeper. My next most common woodpecker is all the way to the other end of the scale, I see the Pileated almost every day. They are in my area and make their presence known with their call, drum or noisy foraging that sounds very much like a carvers mallet and chisel. Our only crested woodpecker, they resemble Woody, except where he’s blue they’re black. The gentlemen have a red mustache while the ladies sport black ones. I’ve never had one on feeders, (some people have) but I see them routinely on my dead trees and fruit, it’s favourite seems to be alternate leaf dogwood, wild cherry and grapes. 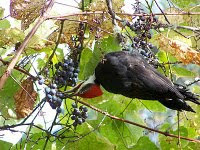 He can be quite the acrobat, hanging vicariously off small suet cages, grape vines and saplings. I’ve seen them bend a cherry sapling horizontal, (they weigh 50 loonies or 17 Downy Woodpeckers) hang upside-down and strip the fruit. Even the way they take the fruit in their beak and toss it back into their mouth is interesting to watch. 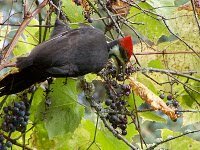 The Pileated will nest in urban areas if there are large enough trees to excavate a nest, there are nests on the Crawley Farm Road, right in Moncton and several others are reported foraging on dead trees in the city. For three seasons the Northern Flicker is plentiful, this one migrates in winter, but spring and fall they pass through in large numbers. In mid to late April you’ll see them on bare areas, in ditches and cleaning up any fruit that may be left on trees. During breeding season they’re very conspicuous, although not showing up at feeders very often, you’ll see them eating fruit and picking up ants on the lawn, which by the way, ranks as the number one ID question I get asked… “I have a bird that looks like a woodpecker, but he’s hopping around on the lawn---tan bird, black spots, red on back of head and black bib” or something like that (males have a mustache). They’re larger than the Hairy, about the size of a Mourning Dove, (they weigh 23 loonies). If you don’t see flickers very often, try to learn their call, it’s similar to the Pileated but higher and longer, they’ll get on top of a light pole and call all day when they’re trying to define their territory. I’ll finish up our other five woodpecker species next week. After nesting in a nearby box, these Eastern Bluebirds check out other sites in the fall. Presumably on the look out for new real estate for next spring.